In Bridging, the Owner engages a design firm, usually an architectural firm for most building projects. This entity is referred to as the Owner’s Design Consultant (“ODC”). 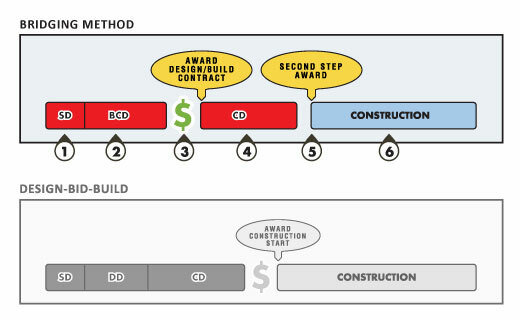 The ODC prepares a set of bid documents (or negotiation documents) that, in its preparation, require about the same level of effort, or slightly more effort, than traditional Design Development (“DD”) documents. However these Bridging Contract Documents (“BCDs”) are substantially different from DDs. In the BCDs, typically, the architectural design is carried much further than in DDs and some items such as finish hardware and plumbing fixtures are selected and specified in detail. There will have been consultation by the ODC with consulting MEPSC engineers, but little or no engineering final design or drawings will be included in the BCDs. Based on these documents, which must fully protect the design and the Owner, firm price bids may be obtained at only about half way or slightly over half way through the total design process. In these documents typically there will be few if any engineered systems design. The engineered systems will usually be covered in combined performance and prescriptive specifications. The Owner’s contract with the Contractor requires the Contractor and its AE to complete the architectural and engineering drawings and specification in accordance with the BCDs and take full responsibility for the completeness, coordination, accuracy and code compliance of these documents as well as for the construction. However, the only way to really understand Bridging is to go into some level of technical detail, which I’m going to do in an upcoming series of posts in which I will describe the 6 phases of Bridging. During that series I will be walking you through the diagram shown below. ← How Is a Bridging Project Organized?